At The Black Horse we’re famous for our fabulous food and people travel from all around the area to enjoy our traditional fayre, served in the unique surrounds of one of Sussex’ finest country pubs. 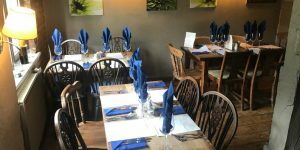 Our menu is currently evolving, but being a traditional country pub we serve home cooked pub fayre and our Specials board hosts a variety of good wholesome meals to suit everyone’s tastes. We include in our selection: seafood, delicious grills and locally sourced game (when available), we never forget our vegetarian guests either and there are always a variety of dishes for them to choose from. We have a number of traditional British desserts such as apple crumble and chocolate brownie to tingle the tastebuds, to mention but a few. Our home cooked Sunday roasts are well loved and all roasts are accompanied by locally sourced seasonal veg and the all important Yorkshire pudd. We strive to source all of our ingredients locally and offer a range of vegetarian and children’s options using only the best seasonal ingredients. It is essential to book, even at lunchtime! All you need to do is call on 01403-891272, email us enquiries@theblackhorseinn.com or fill in our online booking request form and book your table. Please don’t hesitate to get in touch if you have any questions or require further information.